given input data xdata, and the observed output ydata, where xdata and ydata are matrices or vectors, and F (x, xdata) is a matrix-valued or vector-valued function of the same size as ydata. Optionally, the components of x can have lower and upper bounds lb, and ub. The arguments x, lb, and ub can be vectors or matrices; see Matrix Arguments. The lsqcurvefit function uses the same algorithm as lsqnonlin. lsqcurvefit simply provides a convenient interface for data-fitting problems. x = lsqcurvefit(fun,x0,xdata,ydata) starts at x0 and finds coefficients x to best fit the nonlinear function fun(x,xdata) to the data ydata (in the least-squares sense). ydata must be the same size as the vector (or matrix) F returned by fun. Passing Extra Parameters explains how to pass extra parameters to the vector function fun(x), if necessary. x = lsqcurvefit(fun,x0,xdata,ydata,lb,ub) defines a set of lower and upper bounds on the design variables in x, so that the solution is always in the range lb ≤ x ≤ ub. You can fix the solution component x(i) by specifying lb(i) = ub(i). If the specified input bounds for a problem are inconsistent, the output x is x0 and the outputs resnorm and residual are . Components of x0 that violate the bounds lb ≤ x ≤ ub are reset to the interior of the box defined by the bounds. Components that respect the bounds are not changed. x = lsqcurvefit(fun,x0,xdata,ydata,lb,ub,options) minimizes with the optimization options specified in options. Use optimoptions to set these options. Pass empty matrices for lb and ub if no bounds exist. x = lsqcurvefit(problem) finds the minimum for problem, where problem is a structure described in Input Arguments. Create the problem structure by exporting a problem from Optimization app, as described in Exporting Your Work. [x,resnorm] = lsqcurvefit(___), for any input arguments, returns the value of the squared 2-norm of the residual at x: sum((fun(x,xdata)-ydata).^2). [x,resnorm,residual,exitflag,output] = lsqcurvefit(___) additionally returns the value of the residual fun(x,xdata)-ydata at the solution x, a value exitflag that describes the exit condition, and a structure output that contains information about the optimization process. [x,resnorm,residual,exitflag,output,lambda,jacobian] = lsqcurvefit(___) additionally returns a structure lambda whose fields contain the Lagrange multipliers at the solution x, and the Jacobian of fun at the solution x. Input the observation times and responses. Create a simple exponential decay model. Fit the model using the starting point x0 = [100,-1]. Plot the data and the fitted curve. 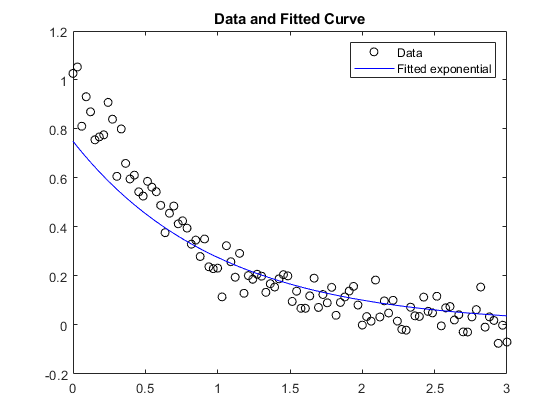 Find the best exponential fit to data where the fitting parameters are constrained. with t ranging from 0 through 3, and ε normally distributed noise with mean 0 and standard deviation 0.05. Solve the bounded fitting problem. the value of the optimality tolerance. Examine how well the resulting curve fits the data. Because the bounds keep the solution away from the true values, the fit is mediocre. Compare the results of fitting with the default 'trust-region-reflective' algorithm and the 'levenberg-marquardt' algorithm. Compare the solution with that of a 'levenberg-marquardt' fit. the value of the step size tolerance. The two algorithms converged to the same solution. 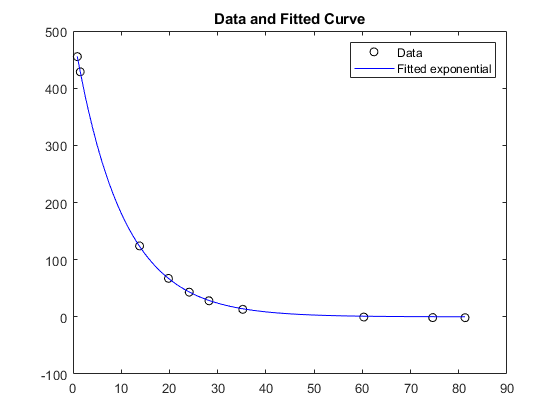 Plot the data and the fitted exponential model. Compare the results of fitting with the default 'trust-region-reflective' algorithm and the 'levenberg-marquardt' algorithm. Examine the solution process to see which is more efficient in this case. Yes, the solutions are equivalent. Which algorithm took fewer function evaluations to arrive at the solution? and the 'levenberg-marquardt' algorithm took 72 function evaluations. Plot the data and the fitted exponential model. The fit looks good. How large are the residuals? and the 'levenberg-marquardt' algorithm has residual norm 9.504887.
fun can also be a function handle for an anonymous function. If the user-defined values for x and F are arrays, they are converted to vectors using linear indexing (see Array Indexing (MATLAB)). fun should return fun(x,xdata), and not the sum-of-squares sum((fun(x,xdata)-ydata).^2). lsqcurvefit implicitly computes the sum of squares of the components of fun(x,xdata)-ydata. See Examples. then the function fun must return a second output argument with the Jacobian value J (a matrix) at x. By checking the value of nargout, the function can avoid computing J when fun is called with only one output argument (in the case where the optimization algorithm only needs the value of F but not J). If fun returns a vector (matrix) of m components and x has n elements, where n is the number of elements of x0, the Jacobian J is an m-by-n matrix where J(i,j) is the partial derivative of F(i) with respect to x(j). (The Jacobian J is the transpose of the gradient of F.) For more information, see Writing Vector and Matrix Objective Functions. Initial point, specified as a real vector or real array. Solvers use the number of elements in x0 and the size of x0 to determine the number and size of variables that fun accepts. where xdata and ydata are fixed arrays, and x is the array of parameters that lsqcurvefit changes to search for a minimum sum of squares. The ydata array must be the same size and shape as the array fun(x0,xdata). If there are fewer elements in lb than in x0, solvers issue a warning. Example: To specify that all x components are positive, use lb = zeros(size(x0)). If there are fewer elements in ub than in x0, solvers issue a warning. Example: To specify that all x components are less than 1, use ub = ones(size(x0)). Optimization options, specified as the output of optimoptions or a structure such as optimset returns. Choose between 'trust-region-reflective' (default) and 'levenberg-marquardt'. The Algorithm option specifies a preference for which algorithm to use. It is only a preference, because certain conditions must be met to use each algorithm. For the trust-region-reflective algorithm, the nonlinear system of equations cannot be underdetermined; that is, the number of equations (the number of elements of F returned by fun) must be at least as many as the length of x. The Levenberg-Marquardt algorithm does not handle bound constraints. For more information on choosing the algorithm, see Choosing the Algorithm. Compare user-supplied derivatives (gradients of objective or constraints) to finite-differencing derivatives. Choices are false (default) or true. For optimset, the name is DerivativeCheck and the values are 'on' or 'off'. See Current and Legacy Option Name Tables. Display diagnostic information about the function to be minimized or solved. Choices are 'off' (default) or 'on'. Maximum change in variables for finite-difference gradients (a positive scalar). The default is Inf. Minimum change in variables for finite-difference gradients (a positive scalar). The default is 0. 'iter' displays output at each iteration, and gives the default exit message. 'iter-detailed' displays output at each iteration, and gives the technical exit message. 'final' (default) displays just the final output, and gives the default exit message. 'final-detailed' displays just the final output, and gives the technical exit message. Scalar FiniteDifferenceStepSize expands to a vector. The default is sqrt(eps) for forward finite differences, and eps^(1/3) for central finite differences. For optimset, the name is FinDiffRelStep. See Current and Legacy Option Name Tables. Finite differences, used to estimate gradients, are either 'forward' (default), or 'central' (centered). 'central' takes twice as many function evaluations, but should be more accurate. The algorithm is careful to obey bounds when estimating both types of finite differences. So, for example, it could take a backward, rather than a forward, difference to avoid evaluating at a point outside bounds. For optimset, the name is FinDiffType. See Current and Legacy Option Name Tables. Termination tolerance on the function value, a positive scalar. The default is 1e-6. See Tolerances and Stopping Criteria. Check whether function values are valid. 'on' displays an error when the function returns a value that is complex, Inf, or NaN. The default 'off' displays no error. Maximum number of function evaluations allowed, a positive integer. The default is 100*numberOfVariables. See Tolerances and Stopping Criteria and Iterations and Function Counts. For optimset, the name is MaxFunEvals. See Current and Legacy Option Name Tables. Maximum number of iterations allowed, a positive integer. The default is 400. See Tolerances and Stopping Criteria and Iterations and Function Counts. Termination tolerance on the first-order optimality (a positive scalar). The default is 1e-6. See First-Order Optimality Measure. Internally, the 'levenberg-marquardt' algorithm uses an optimality tolerance (stopping criterion) of 1e-4 times FunctionTolerance and does not use OptimalityTolerance. Specify one or more user-defined functions that an optimization function calls at each iteration. Pass a function handle or a cell array of function handles. The default is none (). See Output Function Syntax. 'optimplotx' plots the current point. 'optimplotfunccount' plots the function count. 'optimplotfval' plots the function value. 'optimplotresnorm' plots the norm of the residuals. 'optimplotstepsize' plots the step size. 'optimplotfirstorderopt' plots the first-order optimality measure. For information on writing a custom plot function, see Plot Function Syntax. For optimset, the name is PlotFcns. See Current and Legacy Option Name Tables. If false (default), the solver approximates the Jacobian using finite differences. If true, the solver uses a user-defined Jacobian (defined in fun), or Jacobian information (when using JacobMult), for the objective function. For optimset, the name is Jacobian, and the values are 'on' or 'off'. See Current and Legacy Option Name Tables. Termination tolerance on x, a positive scalar. The default is 1e-6. See Tolerances and Stopping Criteria. For optimset, the name is TolX. See Current and Legacy Option Name Tables. Typical x values. The number of elements in TypicalX is equal to the number of elements in x0, the starting point. The default value is ones(numberofvariables,1). The solver uses TypicalX for scaling finite differences for gradient estimation. When true, the solver estimates gradients in parallel. Disable by setting to the default, false. See Parallel Computing. If flag == 0 then W = J'*(J*Y). If flag > 0 then W = J*Y. If flag < 0 then W = J'*Y. In each case, J is not formed explicitly. The solver uses Jinfo to compute the preconditioner. See Passing Extra Parameters for information on how to supply values for any additional parameters jmfun needs. 'SpecifyObjectiveGradient' must be set to true for the solver to pass Jinfo from fun to jmfun. See Minimization with Dense Structured Hessian, Linear Equalities and Jacobian Multiply Function with Linear Least Squares for similar examples. For optimset, the name is JacobMult. See Current and Legacy Option Name Tables. Sparsity pattern of the Jacobian for finite differencing. Set JacobPattern(i,j) = 1 when fun(i) depends on x(j). Otherwise, set JacobPattern(i,j) = 0. In other words, JacobPattern(i,j) = 1 when you can have ∂fun(i)/∂x(j) ≠ 0. Use JacobPattern when it is inconvenient to compute the Jacobian matrix J in fun, though you can determine (say, by inspection) when fun(i) depends on x(j). The solver can approximate J via sparse finite differences when you give JacobPattern. If the structure is unknown, do not set JacobPattern. The default behavior is as if JacobPattern is a dense matrix of ones. Then the solver computes a full finite-difference approximation in each iteration. This can be expensive for large problems, so it is usually better to determine the sparsity structure. Maximum number of PCG (preconditioned conjugate gradient) iterations, a positive scalar. The default is max(1,numberOfVariables/2). For more information, see Large Scale Nonlinear Least Squares. Upper bandwidth of preconditioner for PCG, a nonnegative integer. The default PrecondBandWidth is Inf, which means a direct factorization (Cholesky) is used rather than the conjugate gradients (CG). The direct factorization is computationally more expensive than CG, but produces a better quality step towards the solution. Set PrecondBandWidth to 0 for diagonal preconditioning (upper bandwidth of 0). For some problems, an intermediate bandwidth reduces the number of PCG iterations. Determines how the iteration step is calculated. The default, 'factorization', takes a slower but more accurate step than 'cg'. See Trust-Region-Reflective Least Squares. Termination tolerance on the PCG iteration, a positive scalar. The default is 0.1. Initial value of the Levenberg-Marquardt parameter, a positive scalar. Default is 1e-2. For details, see Levenberg-Marquardt Method. 'jacobian' can sometimes improve the convergence of a poorly scaled problem; the default is 'none'. You must supply at least the objective, x0, solver, xdata, ydata, and options fields in the problem structure. The simplest way of obtaining a problem structure is to export the problem from the Optimization app. Solution, returned as a real vector or real array. The size of x is the same as the size of x0. Typically, x is a local solution to the problem when exitflag is positive. For information on the quality of the solution, see When the Solver Succeeds. Squared norm of the residual, returned as a nonnegative real. resnorm is the squared 2-norm of the residual at x: sum((fun(x,xdata)-ydata).^2). Value of objective function at solution, returned as an array. In general, residual = fun(x,xdata)-ydata. Reason the solver stopped, returned as an integer. Change in x was less than the specified tolerance. Change in the residual was less than the specified tolerance. Magnitude of search direction was smaller than the specified tolerance. Number of iterations exceeded options.MaxIterations or number of function evaluations exceeded options.MaxFunctionEvaluations. Output function terminated the algorithm. Problem is infeasible: the bounds lb and ub are inconsistent. Jacobian at the solution, returned as a real matrix. jacobian(i,j) is the partial derivative of fun(i) with respect to x(j) at the solution x. The Levenberg-Marquardt algorithm does not handle bound constraints. The trust-region-reflective algorithm does not solve underdetermined systems; it requires that the number of equations, i.e., the row dimension of F, be at least as great as the number of variables. In the underdetermined case, lsqcurvefit uses the Levenberg-Marquardt algorithm. Since the trust-region-reflective algorithm does not handle underdetermined systems and the Levenberg-Marquardt does not handle bound constraints, problems that have both of these characteristics cannot be solved by lsqcurvefit. lsqcurvefit can solve complex-valued problems directly with the levenberg-marquardt algorithm. However, this algorithm does not accept bound constraints. For a complex problem with bound constraints, split the variables into real and imaginary parts, and use the trust-region-reflective algorithm. See Fit a Model to Complex-Valued Data. The preconditioner computation used in the preconditioned conjugate gradient part of the trust-region-reflective method forms JTJ (where J is the Jacobian matrix) before computing the preconditioner. Therefore, a row of J with many nonzeros, which results in a nearly dense product JTJ, can lead to a costly solution process for large problems. If components of x have no upper (or lower) bounds, lsqcurvefit prefers that the corresponding components of ub (or lb) be set to inf (or -inf for lower bounds) as opposed to an arbitrary but very large positive (or negative for lower bounds) number. You can use the trust-region reflective algorithm in lsqnonlin, lsqcurvefit, and fsolve with small- to medium-scale problems without computing the Jacobian in fun or providing the Jacobian sparsity pattern. (This also applies to using fmincon or fminunc without computing the Hessian or supplying the Hessian sparsity pattern.) How small is small- to medium-scale? No absolute answer is available, as it depends on the amount of virtual memory in your computer system configuration. Suppose your problem has m equations and n unknowns. If the command J = sparse(ones(m,n)) causes an Out of memory error on your machine, then this is certainly too large a problem. If it does not result in an error, the problem might still be too large. You can find out only by running it and seeing if MATLAB runs within the amount of virtual memory available on your system. The Levenberg-Marquardt and trust-region-reflective methods are based on the nonlinear least-squares algorithms also used in fsolve. The default trust-region-reflective algorithm is a subspace trust-region method and is based on the interior-reflective Newton method described in  and . Each iteration involves the approximate solution of a large linear system using the method of preconditioned conjugate gradients (PCG). See Trust-Region-Reflective Least Squares. The Levenberg-Marquardt method is described in references , , and . See Levenberg-Marquardt Method. Coleman, T.F. and Y. Li. “An Interior, Trust Region Approach for Nonlinear Minimization Subject to Bounds.” SIAM Journal on Optimization, Vol. 6, 1996, pp. 418–445. Coleman, T.F. and Y. Li. “On the Convergence of Reflective Newton Methods for Large-Scale Nonlinear Minimization Subject to Bounds.” Mathematical Programming, Vol. 67, Number 2, 1994, pp. 189–224. Dennis, J. E. Jr. “Nonlinear Least-Squares.” State of the Art in Numerical Analysis, ed. D. Jacobs, Academic Press, pp. 269–312. Levenberg, K. “A Method for the Solution of Certain Problems in Least-Squares.” Quarterly Applied Mathematics 2, 1944, pp. 164–168. Marquardt, D. “An Algorithm for Least-squares Estimation of Nonlinear Parameters.” SIAM Journal Applied Mathematics, Vol. 11, 1963, pp. 431–441. Moré, J. J. “The Levenberg-Marquardt Algorithm: Implementation and Theory.” Numerical Analysis, ed. G. A. Watson, Lecture Notes in Mathematics 630, Springer Verlag, 1977, pp. 105–116. Moré, J. J., B. S. Garbow, and K. E. Hillstrom. User Guide for MINPACK 1. Argonne National Laboratory, Rept. ANL–80–74, 1980. Powell, M. J. D. “A Fortran Subroutine for Solving Systems of Nonlinear Algebraic Equations.” Numerical Methods for Nonlinear Algebraic Equations, P. Rabinowitz, ed., Ch.7, 1970. For more information, see Using Parallel Computing in Optimization Toolbox.